Materials used: Satin, organza, polycotton (reinforcement), acetate lining. For bra cups, cotton wadding. 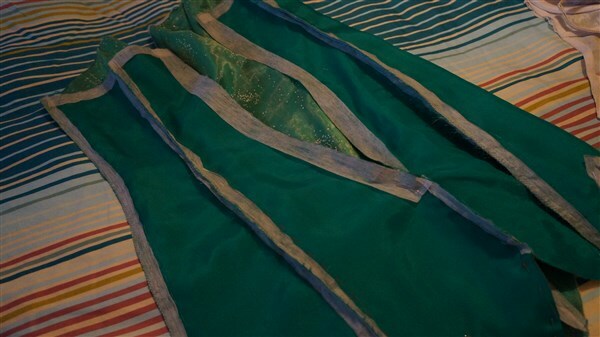 Other supplies: Invisible zip, Rigilene boning, lightweight interfacing, fraystoppa, matching thread. I would like to mention Momo Kurumi cosplay who has inspired this costume with her beautiful take on Tinkerbell. 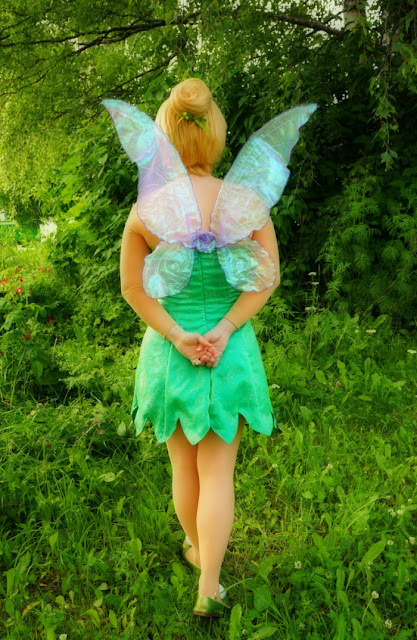 The adult Tinkerbell costume from a 2/3 degree angle. Tinkerbell cosplay costume from the front. You can also make a small pouch like this, although I won't cover it in this tutorial. 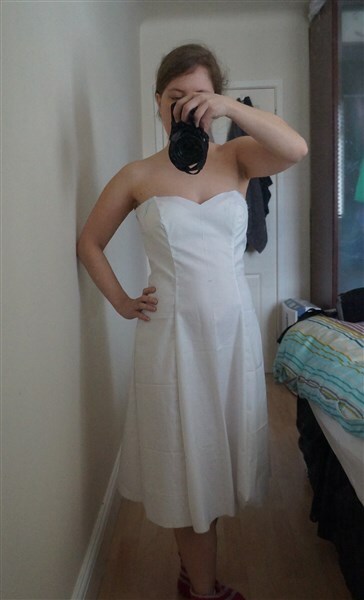 I HIGHLY recommend making a mock-up using muslin or a cheap polycotton. Otherwise, you don't know what it's going to look like. You don't want to ruin your actual fashion fabrics! First of all, purchase and download the Burda Strapless Bustier Designer Dress 2011/02 #165. This is an online pattern, so you are going to print it at home on sheets of A4 paper. Follow the printing and assembling instructions carefully until all of the sheets form a pattern and lay it down on a large surface (or the floor). Determine your size using the sizing charts and trace all pattern pieces on pattern paper or baking paper. Cut traced pattern pieces. Don't add any seam allowance! You will add this when you cut your fabric. This pattern has got a seam underneath the bust, so you are going to want to remove this seam by combining the bust pieces and the back yokes with the corresponding hem bits. This is easy - just match each piece with their pair and attach with clear tape (try not to overlap them). Attach bust and back yokes to the corresponding hem bits with clear tape. Don't overlap pattern pieces. 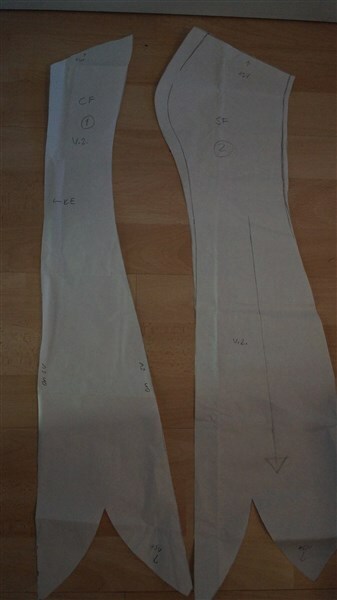 Use cheap polycotton or muslin and trace the pattern pieces, cut and sew long seams. This is what it should look like when long seams are done! Ok, now it's the time to adjust anything you don't like. Most of the adjustments will be done on the Center Front (CF) and Side Front (SF) pieces. If you have experience in making pattern adjustments this will be rather easy. If you don't have this experience, worry not - This pattern might (depending on your body shape of course) pass as it is, so if you want, you can skip adjusting. However, you will have to modify the hem to the "zigzag" pattern. I just moved the bust seams towards the centre a little bit, and more importantly I made the sweetheart neckline more prominent by making the bust curves taller. Adjusting the sweetheart neckline. The pencil line marks the new edge. You can see that I have increased the curve. This is what my Center Front (CF) and Side Front (SF) looked like after adjusting the neckline and bust seam. Now you will want to make a zig zag pattern for the hem. However, I would be better off calling this a leaf tip pattern, as you will soon see. Inspired by Momo Kurumi's Tinkerbell cosplay! Paper with square guides is good for this, so find some and draft a triangle. Determine the width roughly by measuring the width of your hem and diving by whatever you want to be the number of triangles on the finished hem. I had 11 triangles on the hem in total and my draft triangle was about 17 cm (6.7 in) wide and 13 cm (5 in) high. After drawing the triangle I rounded the sides by drawing curved lines over the initial sides. This gives a softer and a more pleasing look than a harsh, geometric zig zag shape. It also gives the appearance of the tip of a leaf. 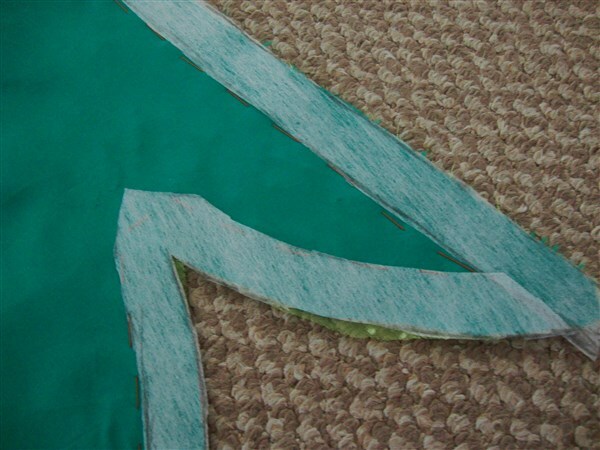 Cut out your finished "leaf tip" triangle and trace on to the hem of the mock up dress. Create a triangle and round its edges for a softer look. Trace the triangle along the hem of the mock up dress. Note that your "leaf tip" triangle is going to act as a rough guideline only. You won't be able to replicate the same shape all throughout the hem (I wish you could!) You will want the seams to be either in between 2 triangles or exactly at the tip of the triangle, and this will not be the case unless you adjust the sizes of the triangles. Don't worry although your triangles will not be of identical size! They don't need to be. Just make sure you have the correct seam placement and that your triangles are of consistent height. It will look fine! 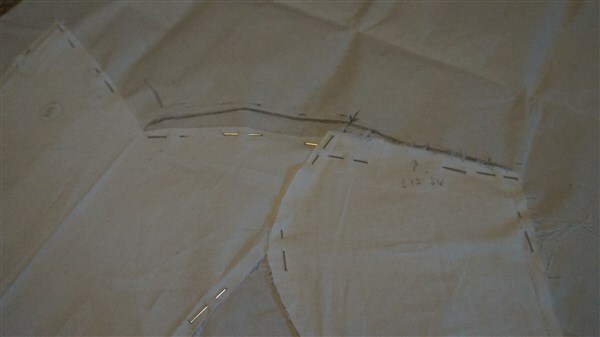 When you have finished drawing the triangles on to the hem, cut it and wear to determine if you are happy with it. Take care to observe the length of the dress and make adjustments if necessary. Un-do all seams on mock up and use pieces as the final pattern OR trace all your adjustments on to fresh pieces of pattern paper and cut. Finished mock-up. Note how the center front seams meet the tip of the triangle/leaf tip shape. The side seams meet in between the 2 triangles. You need to adjust the sizes of the triangles along your hem to achieve the perfect placement with all seams. The fabrics I used. Starting from the right, we have the outmost layer ie. the fancy organza. This is a VERY delicate fabric so care must be taken. 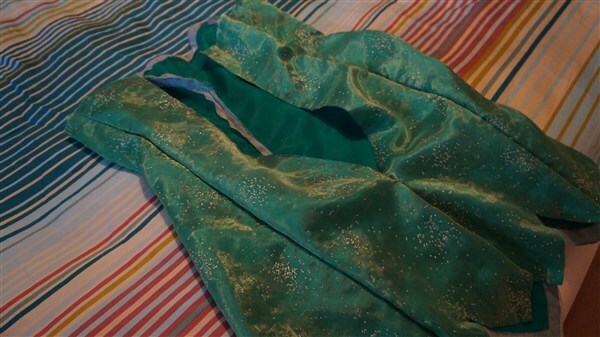 Next, the vivid green satin, mine was very floppy so needed two more inner layers: the green acetate lining and the polycotton for additional body. 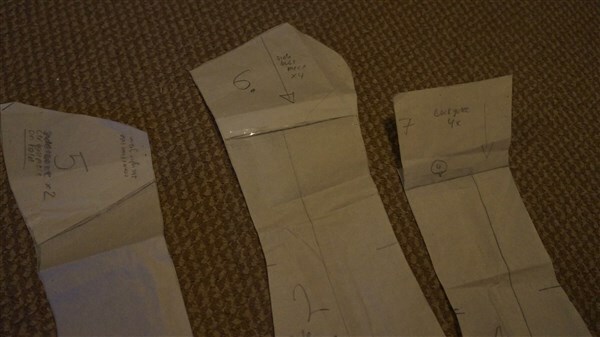 Start by using your altered patterns to cut out fabrics 1) and 2). Remember to add a generous seam allowance for the center back seams (you're putting an invisible zip here). 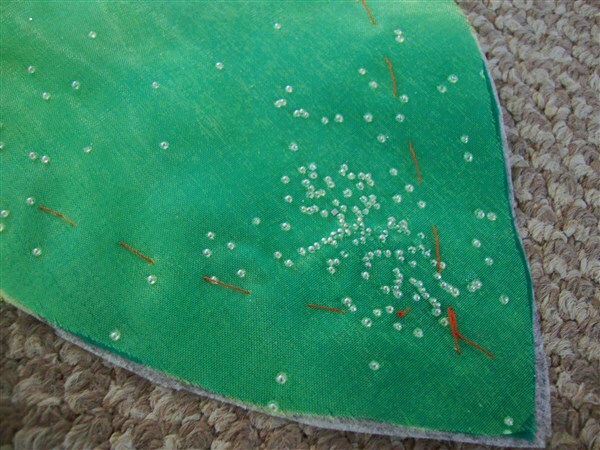 When cutting organza, pin tissue paper underneath which will help to achieve a more accurate result. Then, you'll want to lay all organza pieces over the satin pieces with right sides of both fabrics facing up, and baste together along the edges. Optional step for seam reinforcement: If you are doing the organza layer and your satin is not very sturdy: You'll also want to cut 2.5cm (1in) wide strips in the shape of the edges of each piece, out of light fusible interfacing and iron in place on the reverse side of the satin. 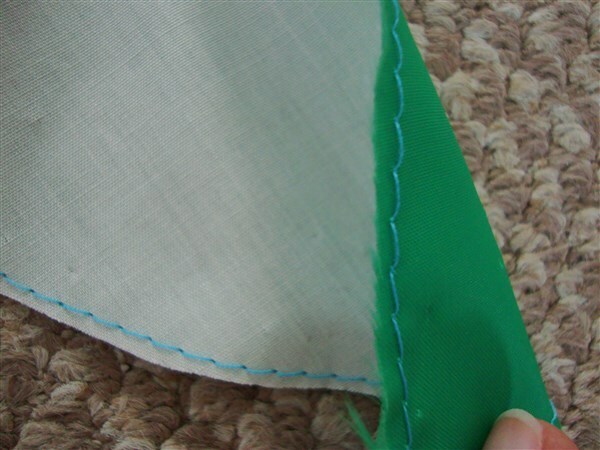 The purpose of this is to add weight around the seam area of otherwise flimsy fabrics. You'll also discover that you're far less likely to damage the delicate organza while sewing the seams if you have a piece of interfacing to reinforce the materials. Organza (#1) and satin (#2) basted together with the wrong side facing up. Added fusible interfacing along edges in order to reinforce all seams that will be sewn in the next steps. This also protects the delicate organza. Here you can see the 2 fabric layers basted together with the orange thread and then the fusible interfacing added on the reverse side of the satin. This is what the fabrics look like from the top. The outmost layer is the organza, underneath is the satin and these two layers are basted together with the orange thread. Next, pin the pieces together on the reverse side. Sew all seams with the exception of the center back which you will leave open for now. 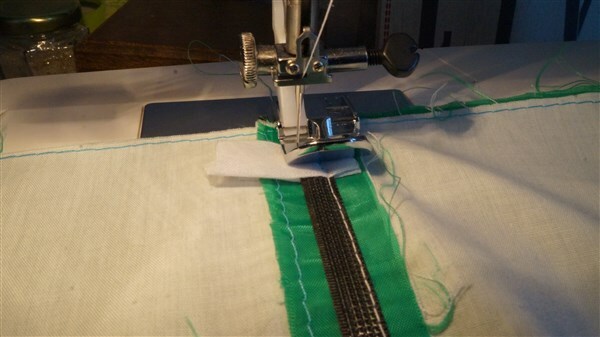 Note that if you did the optional seam reinforcement, you would be sewing over the fusible interfacing. 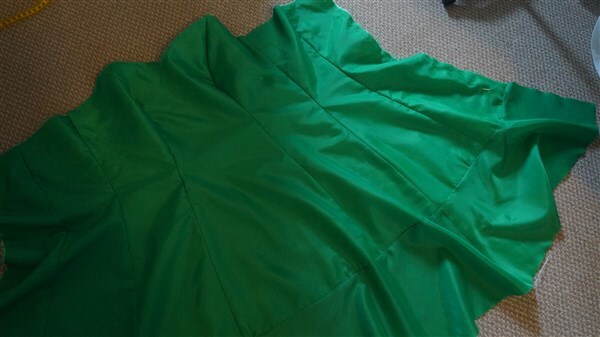 This is the reverse of the dress after the long seams are sewn, with the exception of the center back, facing the top here. I've just pinned the center back up until to where I plan for the zipper to end. 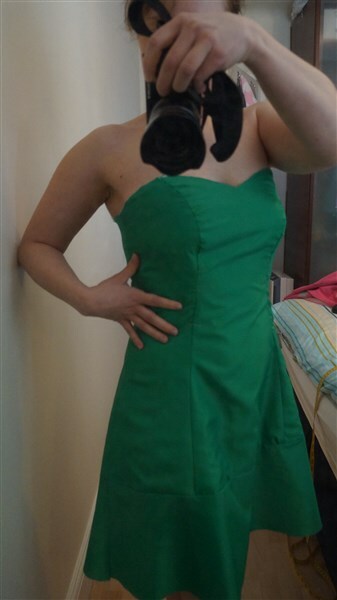 This is the dress from the right side, center back open (partly pinned) and facing up. Now you'll also need to seal the raw edges from fraying. There are a few ways to do this but if you are sewing very delicate fabrics like I was, your safest bet is Fray Stoppa (sort of like glue). You just apply a light layer along all edges and wait for it to dry. In addition, I did a zig zag stitch along the zipper seams at the center back. I also initially tried to do it along the neckline, but I soon discovered that this damages the organza easily!! So I really recommend just a light layer of Fray Stoppa. Zigzag finish can damage the delicate organza. Be careful if you decide to zigzag or interlock. I've applied Fray Stoppa along the neckline, note the dark shadow close to the top. Zigzag stitching the edges of the center back is a bit safer than the neckline because you (should!) have more seam allowance to work with due to the zipper opening. In theory, the inner layers are exactly the same shape as the outer 2 layers. However, in practice, when I did this I had huge issues matching the hem (with the triangular / leaf tip pattern) of the outer and inner fabrics. They just didn't meet! So for this reason, I'd recommend to cut a normal hem, and only cut it into the triangular shape after it's pinned together with the outer fabrics. I'd also recommend leaving an extra generous seam allowance for the center back edges, which will be folded over the invisible zipper at Stage 6. In any case, you'll need to baste the reinforcing fabric on to the lining on each piece, just like you did with the fashion fabrics in the previous step. Then you join the pieces together along the long seams, again leaving the center back open. 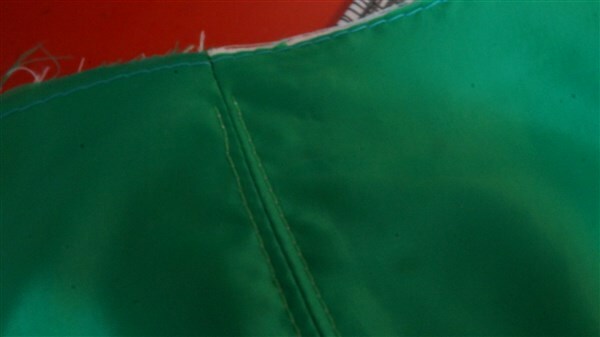 The green fabric is the lining and the white fabric is the reinforcing layer. Baste these together along the very edge. You can use your machine for basting, using the longest stitch setting. Join the pieces together along the long seams, leaving the center back open. The edge of my hem has a seam where it joins a single layer of the lining fabric. You can do this, or have the double layer all the way to the bottom. Wear the lining to observe how it fits. Mine seems to fit fine! However, note that on the actual dress, I would be wearing this the other way around ie. 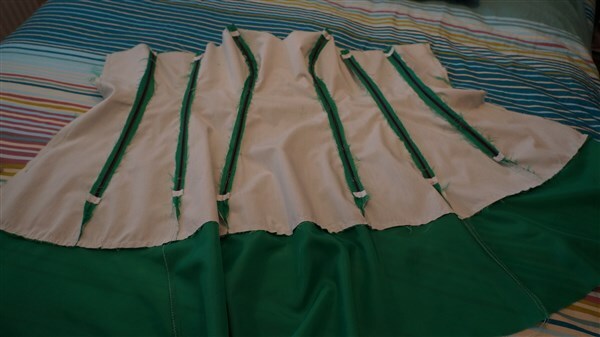 the green lining fabric facing my body and the white reinforcing fabric would be facing the fashion fabrics outside. Here we are using 8mm Rigilene boning, sold in the craft shops by the metre. (You can also use the wider boning, but the thin one is apparently better for the bust seams) You need 6 strips: one for every vertical seam you've just joined in the previous steps. Decide how long you want the strips to be. I recommend to cut them at around an inch or two below your belly button. I made mine too long, and it gets awkward when you sit and the boning bends into a funny shape. So avoid my mistake, and make sure not to make yours too long. The Rigilene comes in a roll so it will be curled when you buy it. Straighten the strips, and then try to bend the tips of the 2 strips going over the breasts into a rounder shape along the top. Rigilene can fray without proper sealing, exposing plastic rods that can be painful if they dig into your skin. So make sure you seal the end using heat (for example, run through a candle flame). Pin over the seams with the seam facing the middle of the strip. To be sure they don't become exposed, cover the ends of the strips with tiny bits of muslin, and sew these in place at the same time when sewing the Rigilene over the seams. Sew the Rigilene vertically along each edge. 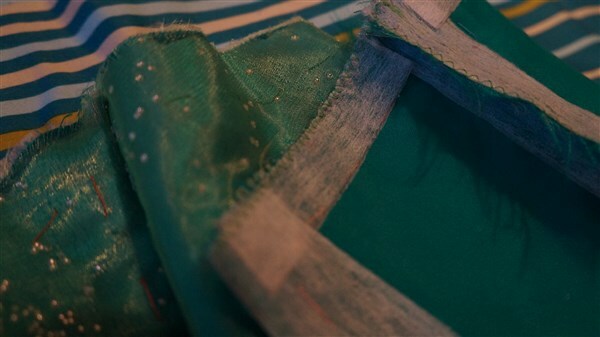 Rigilene is lightweight boning which can be sewn directly on to a fabric and does not require a boning channel to be applied. 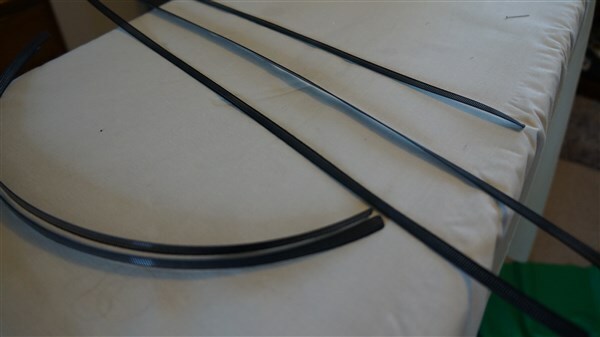 The ends can reveal sharp plastic rods, so make sure to seal them with heat. 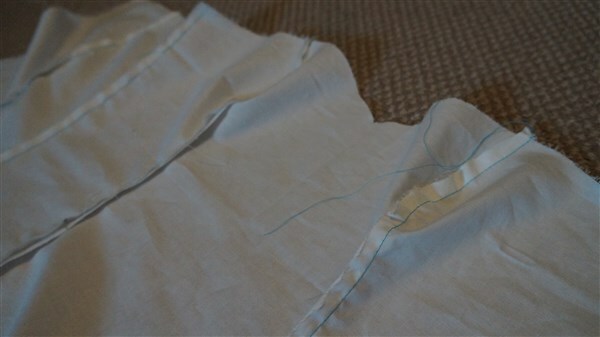 A small piece of spare muslin fabric covers the tip of each Rigilene strip, to ensure it does not become exposed. 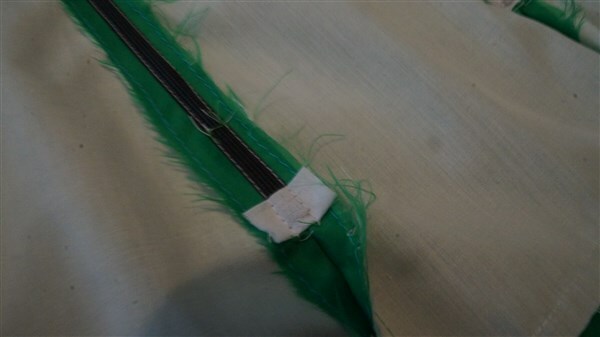 The strip is sewn on at the same time when sewing the Rigilene on (note the white stitching), and trimmed afterwards. Don't worry, Rigilene won't break your machine. 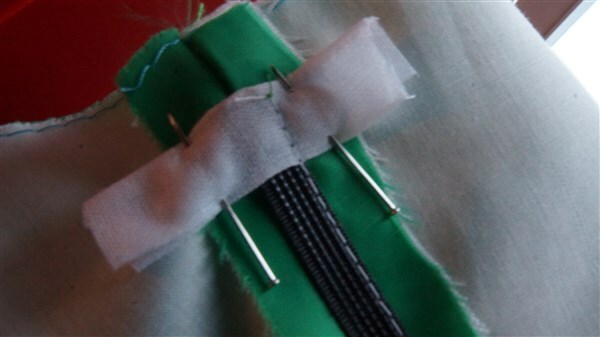 You may find the stitching easier using a Zipper foot. 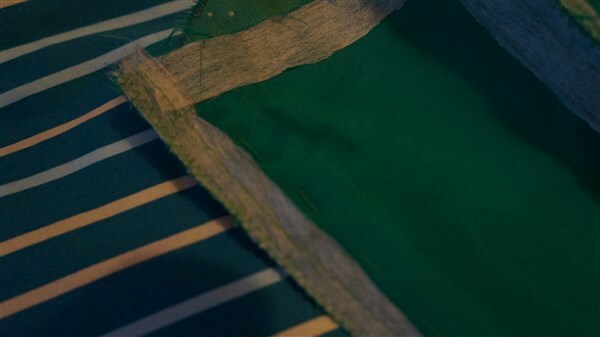 Sew each side of the strip vertically over the centre of the seams. This is how it looks after you have sewn on each side of the Rigilene strip and went over the fabric cover which protects the end of the strip. This is how it will look after you have finished sewing on all of the strips. Note that I made mine too long - an inch or two below your belly button is sufficient! 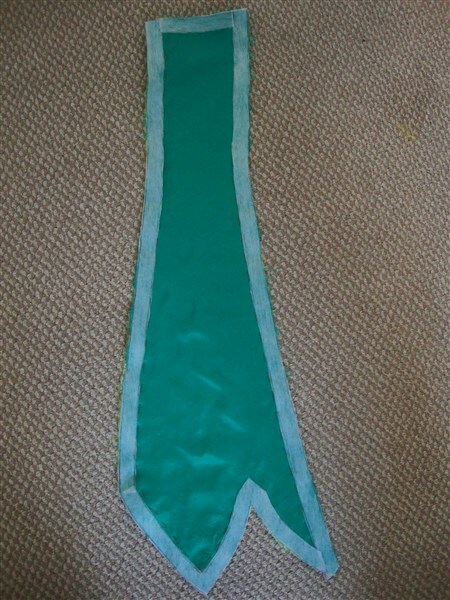 This is how the inner layers will now look from the right side (I used a green lower thread). You can see two vertical rows of stitching close to either side of the seams. This concludes the first part of the Tinkerbell Cosplay Costume Tutorial. Click here to view the second part.